The Rebel Sweetheart. : ONE FC: Rise of Heroes | Toquero's Skills and Experience will Make the Difference. ONE FC: Rise of Heroes | Toquero's Skills and Experience will Make the Difference. 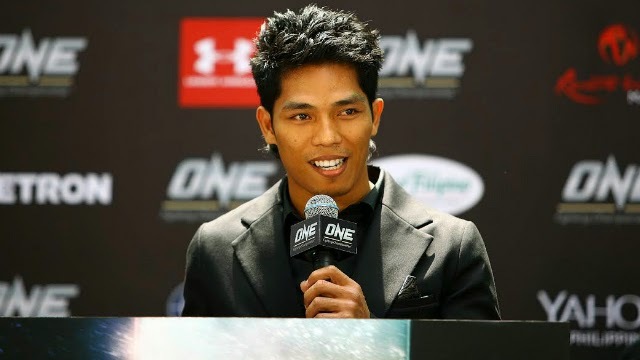 Filipino mixed martial arts (MMA) fighter Eugene Toquero will rely on his experience and skills to beat, even knock out, undefeated American-born Malaysian Gianni Subba on May 2 in the star-studded ONE Fighting Championship card at the Mall of Asia (MOA) Arena. “My experience and skills will make the difference. There will be a knockout and it will be him going down,” Toquero, whose MMA record is four wins and one loss, said. “I have more fights in my career than Subba. I’m a veteran when it comes to competition. Mas maraming baon ako,” he added. Before venturing into MMA in 2009, Toquero, a flyweight like Subba, was a member of the Philippine muay thai national team from 2004 to 2009. In his teen, he was a member of a Cebu kickboxing gym and participated in local competitions. Eugene Toquero at the ONE FC Press Conference. Toquero, 33, admitted that the competition in ONE FC is tough that’s why he’s not taking his fight with Subba, 22, lightly. “Maraming magagaling sa ONE FC kaya hindi puwede pa-easy easy lang. Laro laro din ako pero nandon pa rin ang game plan (There are lots of good fighters in ONE FC that’s why it’s not advisable to take it easy. I play but I still follow my game plan),” the Cebuano fighter said in an interview. Toquero, whose day job is gym instructor and coach to some local celebrities on mixed martial arts, said he has learned some lessons during his first MMA loss to Team Lakay fighter Geje Eustaquio in the ONE FC event last December. “Lessons learned? One should not stop from training. One should learn more techniques,” he said. Toquero said this time against Subba, he’s training hard and spending more time in the gym and has enhanced his fight techniques. Gianni Subba vs Eugene Toquero. Toquero may seem like a brash fighter because of his intemperate comments but in reality he’s silent and serious. “I just want to entertain the fans that’s why I seem like arrogant sometimes." Tickets for ONE FC: RISE OF HEROES are on sale now at SM Tickets. Ticket categories begin with the full Red Carpet and cageside experience for VIPs at PHP 6,360, followed by Patron PHP 3,180, Lower Box PHP 1,280, Upper Box PHP 640 and General Admission PHP 220. Prices include ticketing fee. My BIL likes MMA so I am going to forward him this post. I think it was your blog that I was reading about MMA before, anyway I told my hubby about it and now he LOVES it!! I think I was reading you blog before and seen information about MMA. I told my hubby all about it and he checked it out and no he LOVES it! I do occasionally watch UFC/etc. here in the US, but wasn't familiar with this fighter. Will have to watch for him! My husband watches MMA from time to time. I will have to share this post with him. I´ve been to couple of MMA events and even though I´m not a fan those events are serioussly cool.